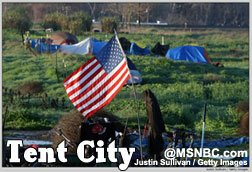 "Tent City" is back in CA. Freaky pics of a worsening economy. Tent City is back :( This is one of the saddest things i’ve come across lately…you’ll have to click through to the slideshow (via MSNBC.com) to get a better feeling of this whole thing, but it’s freakin’ crazy. Previous post: 3 Tips to Putting BLING on That Finger of Hers. Next post: New favorite book: "The Richest Man in Babylon"